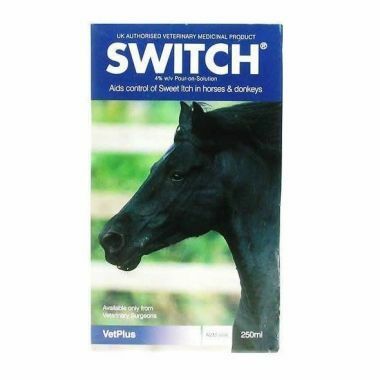 Switch is used to help prevent sweet itch affecting horses & ponies. It does this, thanks to its active ingredient, Permethrin, which acts against the Culicodes midges that cause sweet itch. Switch should be applied weekly from early spring onwards, to help prevent the sweet itch from occuring in the first place. It should be applied topically to the mane & hindquarters (avoid the saddle area). Application Instructions: 1ml per 10kg of body weight, up to a maximum of 40mls, for horses & donkeys. For example, 35ml for a 350kg pony. Killitch is a soothing lotion, containing a strong insect repellent & Benzyl Benzoate; it has been proven to prevent sweet itch, a condition that can cause so much suffering & discomfort in affected horses. Nettex Fly Repellant Standard gives up to 24hours protection against biting midges & flying insects. It contains high strength DEET, as well as moisturisers & conditioners; which means it is suitable for use in sensitive skinned horses & ponies too. Nettex Fly Repellant Advanced contains high strength DEET & gives up to 72hours protection against biting midges & flying insects. Additional moisturisers & conditioners allow slow release & protect the coat. Barrier Super Plus Fly Repellent is an all-natural, popular & effective repellent against midges, horse flies, bots & all types of fly. It was voted "Best in Test" by Horse Magazine in 2013 & 2014. Horslyx Garlic Licks contain pure garlic oil & are proven to reduce fly irritation & signs of sweet itch. They contain all the essential vitamins, minerals & trace elements, that your horse needs, as well as Biotin, Methionine & Zinc, for healthy hooves. Fidavet Cavalesse sachets are a natural supplement that contain Nicotinamide (a form of Vitamin B3), which has a positive effect on the immune system of your horse's skin. It is beneficial for sweet itch & other types of allergic skin disease. Yumega Horse Skin & Coat is full of the highest quality oils, rich in Omega 3 & 6 oils, to nourish & support your horse's skin, giving them a beautiful, shiny coat. It also contains Vitamin E, an antioxidant that supports natural skin defences. A new generation in fly protection. Combining natural ingredients and active substances with modern long duration technology for a new defensive weapon and a guarantee of protection for your horse, for up to 7 hours.